You’ve started eating more whole foods. Or you’ve switched over to the Whole Foods lifestyle entirely. And now it seems your stomach grumbles all the time, you feel hungry more often, and once in a while (maybe more than that?) you get downright hangry! Here we’ll talk about why that happens, what you can do to avoid it, and the best way to eat whole foods to make you feel full. This is the sixth article in a series of Whole Foods Eating articles. Click the links below to follow along. There are some challenges to deal with as you change the way you eat as you try to eat healthier. When switching to whole foods, not only are you trying different foods and recipes, but you’re also reacting differently to what you eat. Ideally, you should be feeling better – more energetic, more regular, and less blah (you know that feeling). But sometimes you end up feeling hungrier and you feel that way more often. And sometimes you feel hangry. 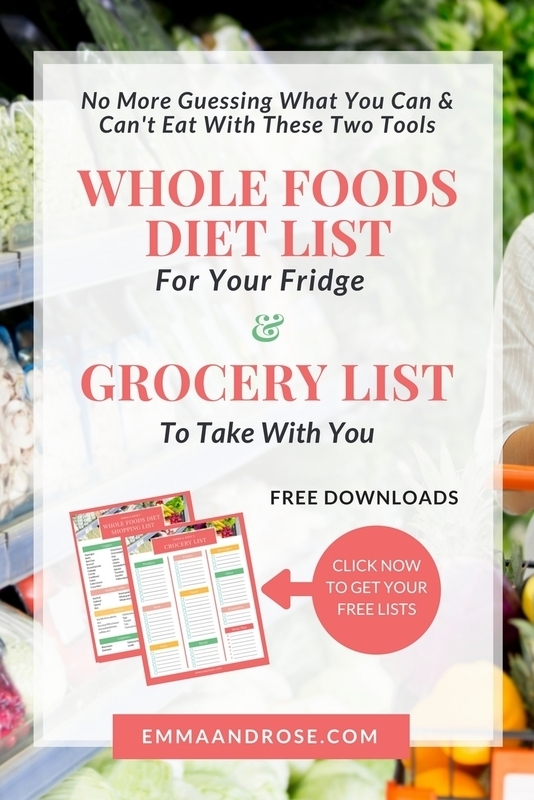 Get your FREE Whole Foods Diet List & Grocery List to make your shopping easier. No more guessing what you can & can’t eat with these two tools. So why does that happen when you start eating whole foods? Well, processed foods tend to be made with ingredients, preservatives and additives that don’t easily get absorbed into your body. If you think about it, processed foods are meant to have as long a shelf life as possible, which could mean they’re going to stick around your belly longer than unprocessed foods. In comparison, whole foods don’t have all that junk and are naturally absorbed into your system more quickly. That means your body gets all those great nutrients faster, but it can also mean you’re hungrier sooner. So consider how you feel after eating a couple of slices of pizza or a burger and fries. You most likely feel full, sometimes bloated and weighed down, but for the most part you feel you can probably get through several hours without any hunger pangs. But when you start eating more whole foods like fruits and vegetables, you may find you don’t feel as full for that same amount of time. Don’t forget to click here to pin this article “The Best Way To Eat Whole Foods To Make You Feel Full” to your favorite Pinterest board for later. Again, that goes back to your body absorbing whole foods faster than processed food or junk food. But it can also lead to the temptation of resorting back to eating less healthy foods or eating more than your body needs. But don’t stress. If you learn how to eat whole foods to make you feel full, you’ll be able to stick with eating healthier. It boils down to making sure you are eating enough of the right foods at every meal. Then what are the whole foods to make you feel full? Is there a list I can print out and follow? Well, the answer isn’t in a list of foods to eat, it’s in the balance of macronutrients (protein, fats and carbohydrates) and fiber you should have with each meal. First, you want to include protein in every meal. Ideally you want a minimum of a third of a gram of protein for each pound you weigh or, in other words, a third of your body weight in grams of protein. For example, if you weigh 120 pounds you should eat a minimum of 40 grams of protein per day. The DRI (dietary reference intake) or daily minimum recommended by the National Institutes of Health for the average sedentary person is 0.36 grams per pound. Protein is an important part of our bodies and many of us don’t eat enough of it. If you’re a whole food meat eater or whole food clean eater, you’ll get the majority of your protein in the meats and seafoods you eat. And if you’re a whole foods plant based eater, since you don’t eat meat, you’ll need to turn to legumes and grains to get the protein you need. See First Thing You Need To Do When Switching To Whole Foods for more info on the three types of whole food eaters – Whole Food Meat Eater, Whole Food Plant Based Eater, and Whole Food Clean Eater. To eat whole foods to make you feel full, include a portion of your recommended daily minimum of protein in all your meals. Get your FREE Whole Foods Diet List & Grocery List so that you no longer have to guess what you can & can't eat on a whole foods diet. Second, you want to include fiber in every meal. Fiber is fantastic in helping you feel regular and naturally cleaning out your system. It also aids in helping you feel full. All fruits and vegetables contain plenty of fiber. Here’s a sample of whole foods rich fiber. To eat whole foods to make you feel full, include fiber in all your meals. Third, you want to include healthy carbohydrates, or carbs, in every meal. Two of my favorite sources of healthy carbs are sweet potatoes and cauliflower. Both work with all three types of whole food eater and can be eaten many ways – baked, roasted, riced or mashed. And just as fruits and vegetables provide loads of fiber, they’re also a great source of healthy carbs. Here are a few suggestions for adding healthy carbs to your meals. To eat whole foods to make you feel full, include healthy carbs in all your meals. Lastly, you want to include healthy fats in every meal. Fats take a longer time to digest and will stay in your stomach longer. This promotes a feeling of fullness and in turn helps suppress your appetite. To eat whole foods to make you feel full, include healthy fats in all your meals. If you want to succeed in eating more whole foods or to switching over to the Whole Foods Lifestyle, it is important to learn how best to eat whole foods to make you feel full. Doing so will help keep you from resorting back to eating junk food or convenient processed food to feel satisfied. So make sure to plan your meals to include protein, fiber, healthy carbs, and healthy fats to feel fuller longer. Now it’s your turn. Do you feel hungrier or even hangry when eating whole foods? What do you struggle with when eating whole? Share in the comments below. I’d love to know. It’s amazing what a healthy diet can do for you – how good it makes you feel is the best part! It’s made such a huge difference in my prognosis with Graves Disease. But it also leaves you looking your best, since awesome nutrients lend a hand to things like skin and hair health. Pretty wonderful bonus! I’m always fascinated by what simple, wonderful foods can do for your body. It’s truly marvelous. That’s great to hear a healthy diet has helped you with Graves disease. So many diseases and ailments can be relieved or symptoms minimized by eating healthier. And you’re right, even the smaller things like no longer suffering from acid reflux & indigestion or having stronger nails are within reach when we clean up what we eat. Thank you for this awesome guide. I eat bread toast for breakfast everyday because I have always found it more filling than other (Indian) breakfast options. Now I know why. Hopefully I can find the energy to switch over to a different and healthier breakfast. You can still eat toast, but switch to whole grain or whole wheat bread. And add a protein source like eggs or oatmeal with chia seeds. Excellent in depth article. Pinned. Thank you for the tips, this is great! We’re trying to focus on eating whole foods, but it isn’t always easy. You’re very welcome. You’re right, changing the way you eat can be challenging. But implementing even the smallest of changes each week can add up. So keep at it and you’ll be glad you did. You have a really nice article there . Food and eating is one of those topics that people really want to be healhty but really don’t to search about . WOW! In-depth post. I’ll also believe in eating Whole Foods as well. That’s great! Thank you and thanks for checking out the post.